Greetings, kiddies! We’re Matt and Jason — the CREEPS! — and we’ll be your guides on this five-part journey into fear. 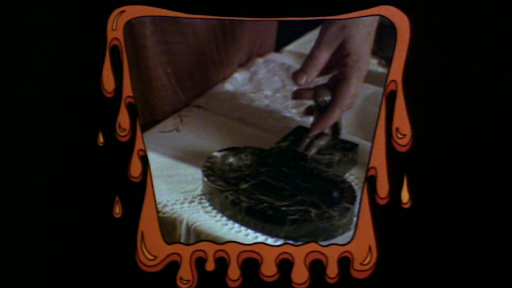 So get yourself some cake and gasp like a lunkhead as we creep up on you with commentary for the 1982 anthology, Creepshow. Awful anecdotes, yell yarns and fearsome fables will unfold in the form of movie background, the merits of long-haired ladies, more mass murder fantasies, Matt’s home bar project, libertines, Netflix gripes, alcohol faux pas and other means to measure the bite marks. And, if you can hold your breath for a long, long time, we might even chat about some things after the movie. Of course, you know that if your dad catches you listening to this podcast again, you won’t sit down for a week. Remember that! Tuck in! A chin cup was formed into the bottom of the mask and attached to Fellucci’s jaw to enable the opening and closing of Fluffy’s maw (used to particularly wonderful effect in the Barbeau twin’s demise sequence). Tubes were run behind Fluffy’s two front teeth thru which Savini and crew could pump glycerine to give the drooling effect and the lips were animated in several sections by cables which enabled him to snarl in either side of his mouth individually or all together at once. Condoms were then glued into Fluffy’s cheek hollows which could be inflated with a valve attached to a rectal syringe (you’ll have to ask Matt about that one) to allow the wonderful breathing in the cheek effect glimpsed in the finished film. On top of all of this engineering wizardry, a mechanism was built which could raise and lower Fluffy’s eyebrows and therefore breathe some humorous personality into the character. All of this took several weeks of 14-hour days for Savini and crew to dream up and execute but the work was only half-finished. The effects team then had to operate it! At times there were six or seven crew members operating the controls on Fluffy — one doing eyebrows, one the lower lip and another the upper, one pumping saliva, another operating that rectal syringe (oh my! ), one to work the prophylactics for breath, another operating the feet when necessary, and of course poor ol’ Darryl Fellucci inside the creature chomping his jaws and moving dramatically to and fro. Fellucci also operated the hands which were sculpted by Rick Catizone (who also sculpted the chest area) and in the actual physical biting sequences a hand puppet was constructed with rubber teeth (so as not to injure the actors) which was utilized and operated by Savini himself. All in all, I think most of you will agree that Fluffy is one of the most beloved creatures in horror film history and our collective hats should come off in honor of the Sultan of Splatter, Sir Tom Savini. More kudos go out to Darryl Fellucci, who aided mightily with the mechanization and without whose blood, sweat and tears Fluffy wouldn’t have had a semblance of his onscreen persona. We, the Fiends, are deeply grateful and forever indebted. Thank you. Condoms, rectal syringes, glycerine and Savini’s grand-daughter, oh my! Pleasant dreams, Terror Fiends!